City of St. Thomas (Single Tier Elgin)Record Owner? Log in. Pop. 31,319. City in Elgin C., on Kettle Cr. and Hwys 3 & 4, 29 km S of London. The settlement was founded in 1810 by Capt. Daniel Rapelje from New York State, a veteran of several battles in the War of 1812. He built a grist mill and laid out his farm in lots, which he sold to settlers. He donated one of the lots for St. Thomas Anglican Church, which was built in 1824 and is still standing. Also in 1824, Dr. Charles Duncombe and Dr. John Rolph opened Upper Canada's fIrst medical school which they called The Talbot Dispensatory. Dr. Duncombe was an ardent supporter of William Lyon Mackenzie's Reform Party, played an active role in the Rebellion of 1837, and was forced to flee to the United States after Mackenzie's defeat at Montgomery's Tavern. On Christmas morning, 1870, fire wiped out half of St. Thomas' business section. The water supply was low, the hoses were in poor condition, and the only way the volunteer fire department could bring the fire under control was to tear down wooden structures in the fire's path. In 1985 a statue of Jumbo, 10 percent larger than life size, was erected at the western entrance to the city despite considerable opposition. The monument has since drawn up to 101,500 visitors in a single year. St. Thomas was the home of Mitchell F. Hepburn, premier of Ontario 1934-1942.
the colonizer of southern Ontario, who established thousands of settlers along the Talbot Rd. (The St. was added for assonance). St. Thomas Aerial Tour from Luke Gibson on Vimeo. Natural Resources Canada in the County of Elgin. 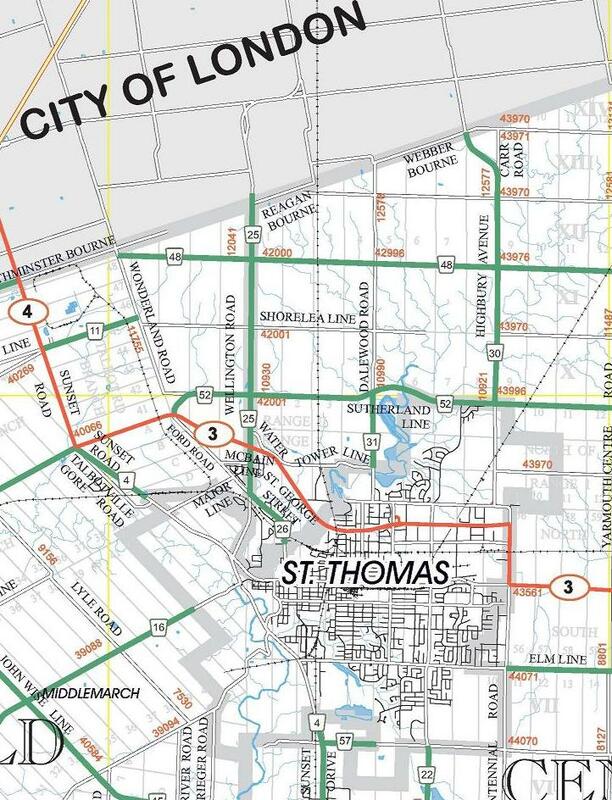 Have something to say about City of St. Thomas (Single Tier Elgin)?